﻿ Fuente Pension House, Cebu | FROM $17 - SAVE ON AGODA! "Price is good compared to the other cheap hotels in the area..."
Have a question for Fuente Pension House? "The building is situated near the Fuente rotunda which has many establishments to provide the need of a traveler." "Near taboan market staffs are very nice and considerate." "This place is highly recommended." 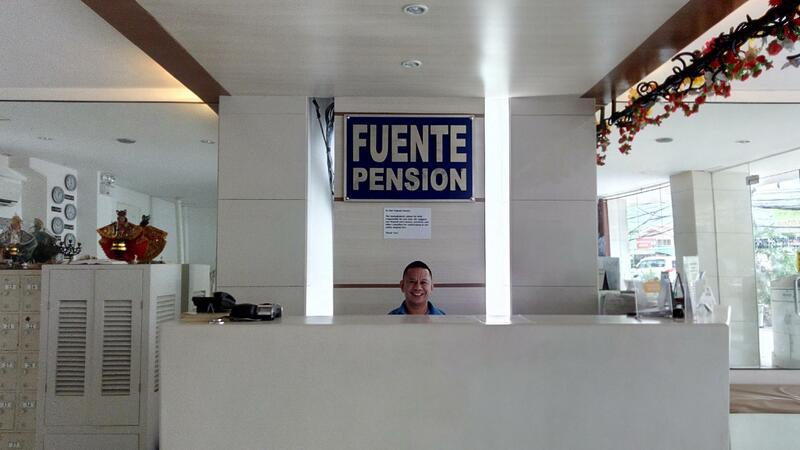 Situated in Cebu City, Fuente Pension House is the perfect place to experience Cebu and its surroundings. From here, guests can enjoy easy access to all that the lively city has to offer. With its convenient location, the hotel offers easy access to the city's must-see destinations. Fuente Pension House offers impeccable service and all the essential amenities to invigorate travelers. The hotel provides 24-hour room service, free Wi-Fi in all rooms, 24-hour front desk, luggage storage, Wi-Fi in public areas to ensure our guests the greatest comfort. The ambiance of Fuente Pension House is reflected in every guestroom. television LCD/plasma screen, internet access – wireless (complimentary), air conditioning, desk, television are just some of the facilities that can be found throughout the property. Besides, the hotel's host of recreational offerings ensures you have plenty to do during your stay. Whatever your reason for visiting Cebu, the Fuente Pension House is the perfect venue for an exhilarating and exciting break away. "Great location, close to "Fuente Osmenia", Banks, Hospitals,..."
This hotel is 2 minutes walk from the Fuente Osmena Circle. The staff are friendly and helpful and there is a restaurant on the top floor. The rooms are cleaned daily and there is a same day, reasonably priced laundary service available at the hotel. Thank you for your review and for choosing our hotel. We appreciate your positive feedback about our hotel. We do take pride in catering to our guest's needs the best way we can. We are looking forward to having you again as a guest in out hotel. :) GODBLES! Great location, close to "Fuente Osmenia", Banks, Hospitals, Shopping Malls, Dentists, Labors and everything else you need. Very friendly and helpful staff, (I visit this place since 6 years! Always same Staff and brilliant). Nice and affordable restaurant with delicious dishes at the 6th floor, with open windows, so always a breeze and overlooking. It offers free newspapers and WiFi. The rooms are clean, many TV channels, WiFi everywhere (I used so many different rooms already). The Beds are very good for sleeping! Not too hard and not too soft. (I bought the same Dewfoam pillows and mattress for my home even!) If you like daylight (like me) be careful. a few (only) rooms ton't have a window. In short: For me the best Joyce. Thank you for taking the time to review and giving us a perfect rating. I'm sure our entire hotel staff enjoyed catering to your needs as much as you enjoyed your stay. If youre travelling to our area again soon , dont hesitate to call us! :) God bless!!! The building is situated near the Fuente rotunda which has many establishments to provide the need of a traveler. The pros of it are: firstly, the staff are helpful who provided our needs even the dipper and bucket we requested. Secondly, they provided us a complimentary breakfast even though we paid for room with out breakfast. Lastly, they have a note that the hotel is hypoallergenic which is really the the linens and towels smells good. The only cons of it are: firstly, not all the room have good signal to WIFI. Secondly, they are not cleaning the room automatically, the guest needs to request for it. Lastly, there is no complimentary water even a bottled one. Pro's- Good bed, hot shower, aircon ok, super clean room. Wifi amazing, good sized room. Cable tv good. Lots of food options in area, night food market. Booked one night stayed 5, would stay again. Cons- aircon noisy, some noise from street music at night, but quitens down at 11. Cleaning staff a little noisy in mornings from 7am onwards. Due to a colleague having to cancel a meeting, I was left with a no-refund situation and explained my predicament to the lady in-charge and she kindly said to contact them when I could stay and they would honor the reservation. Wow! There are nice people left in this crazy world of ours. Good location,friendly. A safe in the room would be a plus. The blue mat in the bathroom don't belong there. Bacteria,my idea. The cleaners who have a room next door could be less noisy at all times. But of course not every room is located near them. It used to be better. The rooms are looking like they need a bit of a freshen up, the shower was cold. The rooms clean. The internet works ok . The TV is fine. Breakfast, usual Cebu sweet fare. It's ok and it's in the right area for the bars. Staff are nice. Location 1. near pier 1 2. near south bus terminal 3. near taboan market staffs are very nice and considerate. they give welcome breakfast however we were not able to claim it as we always leave early. this place is highly recommended. Very central, very good location, everything is within few min walking distance, definitely good value for money. it is 24-hour hotel, so if you check in at midnight your check out time as midnight too, handy! Stayed many times as it really is ok, everything works. Rooms could be a bit brighter painted, but otherwise I have no issues, fits the purpose, which for us was to shower and sleep. This place is very basic but in a great location. It's in a quiet back alley right between Fuente Circle and Mango Square. The best part is your check out time is determined by when you check in. You have 24 hours. This is great for those that need to check in late and check out late. Place is central on a safe road. Rooms are ok, terrible wifi, breakfast was very basic - unidentifiable rubber meat and white bread. It was fine for one night but wish we'd paid a couple of pounds more to stay in Uncle Tom's nearby where we'd stayed on our return from Moalboal. First, they stopped smoking in the bedrooms. Understandable - there are places at every floor. then, they stopped smoking at the restaurant AND at every floor. The only place now is a hidden, thirty place outside behind. HEY?! I'm a strong smoker! I will not more book that place, even I still can recommend this place, for Nonsmokers only. And WHY agoda wants me to allow "walkme.com"? !